It’s been a few weeks since I’ve posted due to an influx of work and life circumstances, but I am glad that today I am able to get back on track. 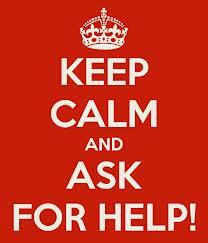 “Asking for help” is one the hardest things for me to do. I’m sure I am in great company with those who often works behind the scenes, picks up the torch without anyone asking us, or leading because we have to not because we wanted to. I’m speaking to the “us’s” in the world (if that’s even a word). Recently, I found myself in a situation where I needed help, but several reasons I hesitated in asking others to help me: pride, vulnerability, perception, and other insecurities that stems from my past relationships. The Lord convicted me, when I began to blame others who saw the need and did not help. He simply said, “why don’t you ask?” At that moment, I shifted my focus from everyone else and started to look inwardly. It wasn’t that my feelings wasn’t legitimate…they were. But the real issue that trumped my offense, was “what don’t I ask for help?” Like most people, I figured, “if others see an obvious need, why don’t they help?” I realize now that I was taking a passive role in the situation along with the sense of entitlement (which was wrong). In order for me to move forward, I have to start with me – addressing my hang ups – not with others, but within me. Now, I challenge myself to stretch beyond my pride and insecurities by being transparent when I am in need. This recent situation gave me the opportunity to take a closer look in the mirror. It also allowed me see things from a different perspective about others inability to help – maybe there were competing priorities that played role in their lack of response – which I’ve accepted.